The Tongariro Alpine Crossing is one of New Zealand’s most popular walks through the Tongariro National Park, a dual World Heritage area. Tongariro Holiday Park provides transport to and from the walk. Three world class ski areas are a short drive from Tongariro Holiday Park, on the slopes of Mount Ruapehu. Read all about Whakapapa, just twenty minutes drive away. The 42 Traverse is one of the premier rides in the North Island of New Zealand and it begins just a short drive away from Tongariro Holiday Park. Renowned for the long and often rutted down hills, this track will test even the most kamikaze of mountain bikers. Visit two nearby lakes – Lake Otamangakau and Lake Rotoira, or travel to the Tongariro, Wanganui and Whakapapa rivers which traverse this region. Rafting, kayaking, swimming and lake cruises make for tons of fun. Tongariro Holiday Park has its own waterfall, take a short walk behind our property and enjoy! Nearby township Turangi deservedly calls itself the Trout Fishing Capital of the World. Surrounding rivers and lakes teem with Rainbow and Brown Trout and fishing enthusiasts come from all around the globe to fish them. It is not unusual to land a 20-pound beauty! Many local operators take Trout Fishing trips – by boat, raft and even helicopter! We’ll be happy to set you with an experienced local guide to show you the ‘secret spots’. On the banks of the Tongariro River, visit the Tongariro National Trout Centre to see wild trout through an underwater viewing chamber, the trout hatchery and even let the kids have a go at catching their own trout. For experienced mountaineers and rock climbers, the mountains and ridges of this region are a veritable playground. Many operators take guided climbing adventures, including abseiling around rugged lava crags. 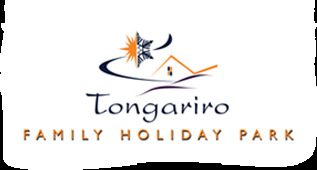 Or explore two indoor rock climbing walls not far from Tongariro Holiday Park - your Tongariro accommodation. This breathtaking area provided the perfect backdrop for the Lord of the Rings movie trilogy, directed by New Zealander Peter Jackson. Local operators can show you ‘middle earth’ – including Mount Doom (Mount Ngaruhoe), Orc Country, Mordor and Ithilien Camp with its beautiful waterfalls and beech forests. Mountain Air can give you the best views possible of this amazing volcanic region -- from the steaming Ketetahi Springs, dramatic Red Crater and classic-shaped Mt. Ngaruhoe to Ruapehu’s active crater. Tokaanu Thermal Pools are just a short drive away and open 7 days until 9pm. There is a large public pool and a safe children’s swimming pool with fresh treated water, heated to around 36 degrees Celsuis. Family-sized private pools are also available brimming with hot natural mineral water which feels amazing on the skin, at temperatures of around 40 degrees.